BAD WEEDS SAN FRANCISCO: Bad Weeds 104: F*ck "Queen!" I'm the Pharaoh! "Hatshepsut: From Queen to Pharaoh highlights the art created during the glorious reign of the female pharaoh Hatshepsut, who shared Egypt’s throne for nearly two decades in the early New Kingdom as senior co-ruler with her nephew, Tuthmosis III. 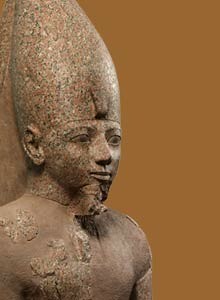 The phenomenon of a woman ruling a fundamentally patriarchal society while surrounded by male courtiers and advisors, the eventual destruction of Hatshepsut’s monuments by Tuthmosis III, and the omission of her name from later king lists have fueled debate among Egyptologists for over a century. This exhibition presents the changing interpretations of the woman, who claimed the full powers of the throne and assumed the title of “King” and the trappings of kingship." Click her photo to visit the deYoung Museum site!